I’ve been making homemade ice cream for years. And, I thought I had a handle on the parts of a custard and how the ingredients come together to freeze just right for ice cream. Thanks to the new book Hello, My Name Is Ice Cream: The Art and Science of the Scoop by Dana Cree, I now have a much, much better understanding of how all of that works. As I read my review copy, I enjoyed learning specifics like that fat helps to trap air as ice cream is churned and that dairy proteins bind to water in the base and prevent ice crystals from forming. I love this kind of information. I never really knew why some ice cream recipes call for corn syrup in addition to sugar, but here, it’s explained that monosaccharides in corn syrup, as opposed to disaccharides in sugar, bind more water which is again to prevent ice crystals. There are also explanations for the use of texture agents and how they affect the final result. By knowing the science behind what each item contributes, you get a clearer picture of what you could and what you should not change in ice cream recipes. You also learn how to create the creamiest texture and best flavors possible. For instance, fat in an ice cream plays an important role in how flavors are delivered. With a higher fat custard, flavors will develop more slowly as you taste them, and they will last longer on your palate. But, in the case of a lower-fat sherbet, the flavor is experienced more immediately. Depending on the flavor in question, you might want a slow, lingering effect or a quick burst. There’s also information about each step of making ice cream and what happens along the way. By curing or chilling an ice cream base before churning, the emulsion is strengthened and produces a better, less icy texture. The recipes are divided among Custard Ice Creams, Philadelphia-Style Ice Creams, Sherbets, Frozen Yogurts, and Add-Ins. Then, there’s a chapter for Composed Scoops that combine flavors, ripples, sauces, and toppings. There are delicious flavors offered in the book like Bourbon Butterscotch Ice Cream, Cheesecake Ice Cream, Bubblegum Ice Cream, Blood Orange Sherbet, and Key Lime Pie Frozen Yogurt. But, what I really appreciated was learning that a Philadelphia-style ice cream with no eggs is a better choice for flavors like chocolate or mint because you’ll quickly taste the subtleties of those ingredients. For coffee flavor that builds as the ice cream melts in your mouth, a custard base is the way to go. I have to explain how I chose the flavor combination shown here. When Kurt and I visit our favorite gelato shop, my go-to order is an affogato with salted caramel gelato. I love the hot espresso with the cold caramel gelato. Here, I kept the same flavors but switched the temperatures. 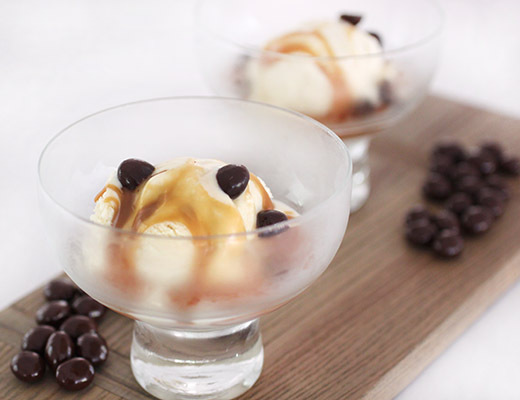 I made the Cold-Press Coffee Ice Cream and topped it with a warm salted caramel sauce. The custard was made with cream, milk, sugar, and glucose. I used light corn syrup for the glucose. Egg yolks were tempered with the hot dairy and sugar mixture, and the custard was cooked until thick. After straining the cooked custard, coffee beans were added and left to steep while refrigerating the base overnight. The next day, the coffee beans were strained out, and creme fraiche was added before churning. The churned ice cream was placed in the freezer to harden for a few hours. 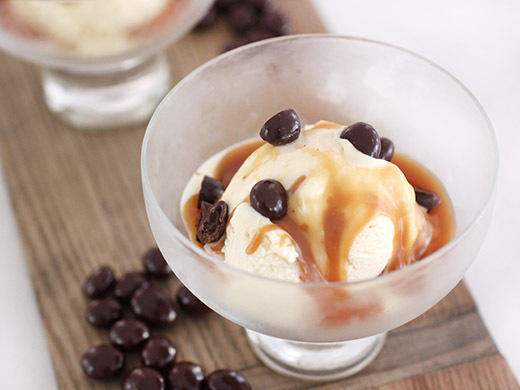 I made the salted caramel sauce for serving and topped the scoops with chocolate-covered espresso beans. The coffee flavor was lovely in the rich custard, and the texture was perfectly smooth and chewy. Knowing the science behind ice cream making is eye-opening. To understand how all the ingredients interact and what each contributes makes me look at other recipes in a whole new way. It also makes me want to try every flavor in this book with all the ripples and swirls and crunchy, crispy toppings to go with them. Reprinted from Hello, My Name Is Ice Cream: The Art and Science of the Scoop . Copyright © 2017 by Dana Cree. Photographs copyright © 2017 by Andrea D’Agosto. Published by Clarkson Potter, an imprint of Penguin Random House, LLC. Coffee was my mother’s favorite ice cream flavor, and one I pretended to like as a child out of sheer admiration for her. As I grew into a coffee-swilling adult, though, I too found a deep appreciation for this flavor. Most ice cream shops add concentrated coffee to their ice cream, making a recognizable tan-colored scoop. As a pastry chef, I learned to flavor coffee ice cream by infusing whole coffee beans into the dairy, giving me a pale-colored scoop with a deep coffee flavor. As cold-press came onto the coffee shop scene, promising a smoother, less acidic brew, it too changed the way I thought about flavoring my coffee ice cream. Heat changes coffee’s flavor, and as it brews, bitter, briny, acidic notes come with it. When I started making a cold-press coffee ice cream, I cooled my ice cream base completely before I introduced the beans. I let them infuse slowly, over the course of a full day and night. The resulting ice cream tastes the way coffee smells, and has the unique quality of being white. I stir in a small amount of tart creme fraiche at the end, and its acidic quality makes this coffee ice cream a very special version of a commonplace flavor—one you won’t forget. For a more classic-tasting coffee ice cream, or if you are short on time, go ahead and add the coffee beans to the milk and cream as they are heating up, and let them steep for 10 minutes before straining them out. You can also replace the creme fraiche with an equal amount of cream, added with the milk in the beginning of the recipe. Cornstarch 10g | 1 tablespoon plus 1 teaspoon, mixed with 20g | 2 tablespoons of cold milk, whisked into the simmering dairy, then cooked for 1 minute. Prepare an ice bath. Fill a large bowl two-thirds of the way with very icy ice water and place it in the refrigerator. Boil the dairy and sugars. Put the cream, milk, glucose, and sugar in a medium heavy-bottomed saucepan, and place it over medium-high heat. Cook, whisking occasionally to discourage the milk from scorching, until the mixture comes to a full rolling boil, then remove the pot from heat. Temper the yolks and cook the custard. In a medium bowl, whisk the yolks. Add 1/2 cup of the hot dairy mixture to the yolks while whisking so the hot milk doesn’t scramble the yolks. Pour the tempered yolks back into the pot of hot milk while whisking. Place the pot over medium-low heat and cook, stirring and scraping the bottom of the pot constantly with a rubber spatula to avoid curdling. Infuse the coffee. 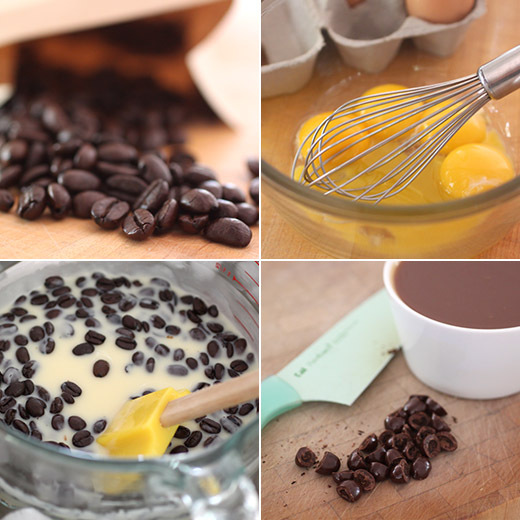 Stir the coffee beans into the cooled custard, and transfer it to the refrigerator to infuse for 12 hours. Strain the custard and add the creme fraiche. When you are ready to churn your custard, strain out the coffee beans through a fine-mesh sieve. Take 1/4 cup of the cold custard and stir it into the creme fraiche until smooth, and then stir this back into the custard. Churn. Place the base into the bowl of an ice cream maker and churn according to the manufacturer’s instructions. The ice cream is ready when it thickens into the texture of soft-serve ice cream and holds its shape, typically 20 to 30 minutes. Harden. To freeze your custard ice cream in the American hard-pack style, immediately transfer it to a container with an airtight lid. Press plastic wrap directly on the surface of the ice cream to prevent ice crystals from forming, cover, and store it in your freezer until it hardens completely, between 4 and 12 hours. Or, feel free to enjoy your ice cream immediately; the texture will be similar to soft-serve. I am a tea drinker, but do LOVE desserts or baked goods flavoured with coffee..this looks incredible! i'm so fascinated by that book! i don't usually like coffee-flavored desserts, but ice cream is the exception! Yummy! Such a delightful treat, Lisa! Any alternative to Glucose syrup? I used light corn syrup instead of glucose syrup. There's also an explanation in the book of how to make invert sugar to use as a substitute. I don't think I've ever tried coffee ice cream before, I bet this is delicious! Sounds like a great book. This sounds so good! My mother's favorite flavor was either coffee or butter pecan. The jamocha almond fudge from Baskin Robbins always did her in! Can't wait to try this and loved the explanation! Science is fun! Sounds like a neat book. Haven't had coffee ice cream in year -- it's SO good, isn't it? At least yours looks awfully good! Lisa what amazing coffe Ice cream look absolutely delicious !! My beloved would go crazy for the ice cream, and I would go crazy for the salted caramel... awesome recipe!